Cities, including the City of Saint Paul, use zoning to regulate land use and scale of development. Zoning studies are a formal review of existing zoning districts within a defined area to determine if new zoning for some parcels of land would be appropriate. The goal is to optimize zoning for both existing uses and for development and investment consistent with the City's Comprehensive Plan and with applicable area plans such as neighborhood plans. In July 2015, the Saint Paul Planning Commission initiated the Snelling Avenue South Zoning Study. The study was initiated in anticipation of the opening of the A-Line Bus Rapid Transit (BRT) on Snelling Avenue (service began in June 2016) and in response to strategies included in the adopted Macalester-Groveland, Highland, and Union Park district councils' neighborhood plans. The study area includes the blocks along Snelling Avenue South between I-94 and Ford Parkway as well as the blocks along Selby Avenue, Grand Avenue, St. Clair Avenue, Randolph Avenue, and Highland Parkway within 1/4 mile of Snelling Avenue. Not all properties within the study area will be recommended for rezoning. 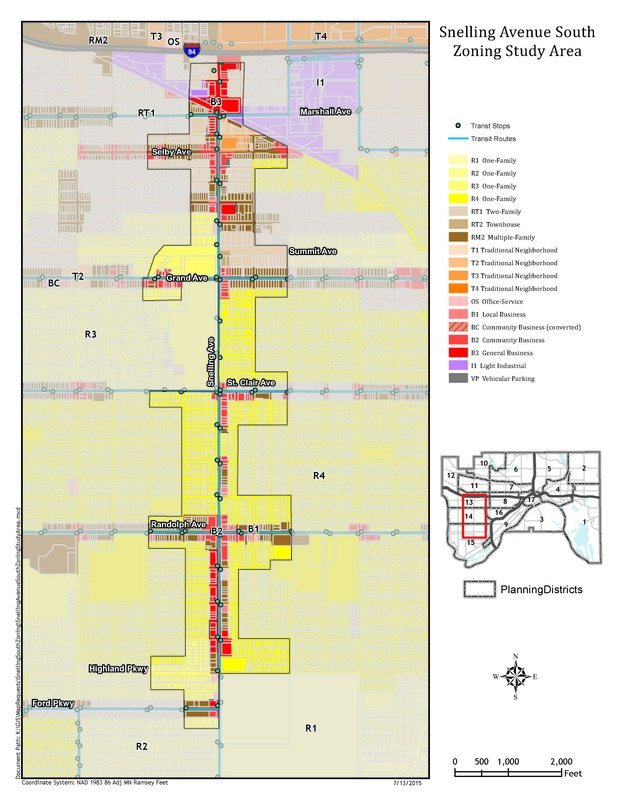 Maps of the proposed rezoning for each of these areas is available. The informal portion of the zoning study included staff work and consultation with the community, District Councils, and Planning Commission. The Planning Commission, based on a recommendation from the Neighborhood Planning Committee, released the study for public review and held a public hearing date on May 19, 2017, and accepted written comments on the study’s recommendations until Friday, May 26, 2017. The comments received were reviewed by the Comprehensive Planning Committee beginning on June 13, 2107. More information on the Neighborhood Committee's review and proposed changes is available in their memo to the Planning Commission. The Committee then finalized the study and sent it back to the full Planning Commission, with a recommendation as to accept the proposed zoning changes. The full Planning Commission then voted to approve the recommendation and forwarded the Zoning Study to the Mayor and City Council for consideration. City Council is considering the zoning changes outlined in the Zoning Study and held a public hearing on Wednesday, September 6, 2017. Following the public hearing, the City Council has the opportunity to make changes to the recommendations and can adopt the changes in full, in part, or not at all. Once the City Council has voted on any zoning change (the first opportunity for them to do so is on September 13, 2017), it goes to the Mayor for final signature. 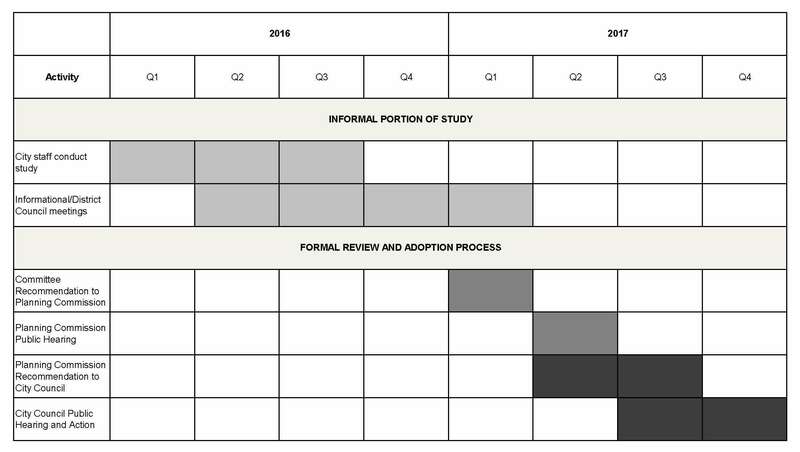 A timeline for the Snelling Avenue South Zoning Study is shown below. Depending on input received, the zoning study may take longer.